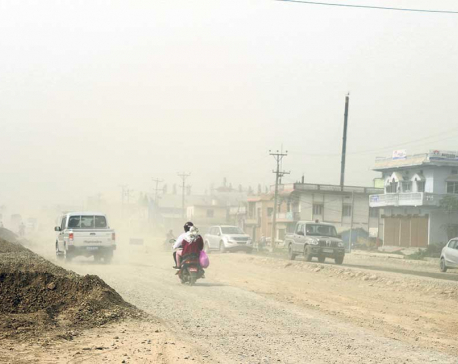 KATHMANDU, April 25: Reconstruction of a total 61.9-km stretch of five earthquakes damaged rural roads have been completed in the last four years, said the Central Project Implementation Unit (Grants Management and Local Infrastructure). 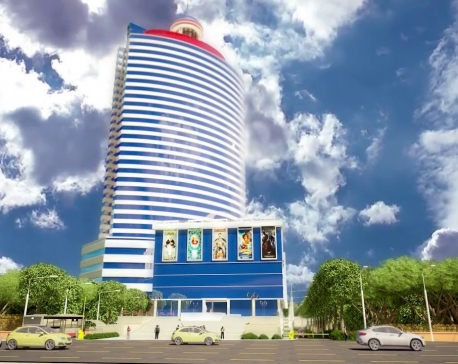 KATHMANDU, April 21: The contract for construction of the Kathmandu view tower has been extended by a year. 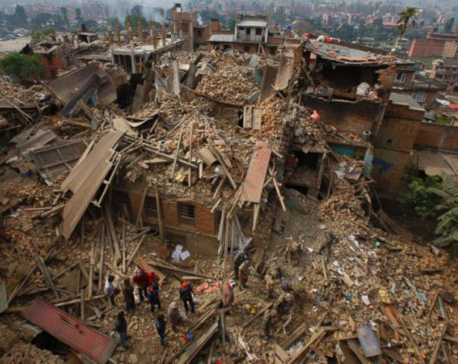 Kathmandu Metropolis extended the contract even though the construction work has not gained any substantial speed. As per the existing contract, 50 per cent of the work had to be completed as of now. 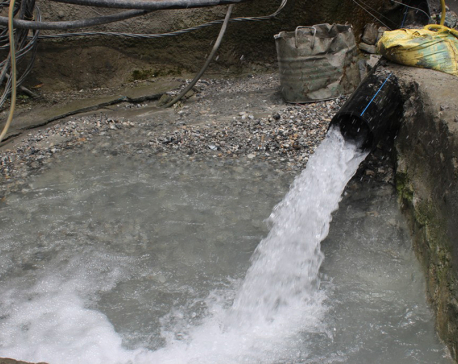 GORKHA, April 18: Construction of Palungtar Kundurtar Irrigation Project has resumed after a gap of 14 years. Construction of the canal, which can irrigate around 500 hectors of land had started in 2002 but was grounded the same year. 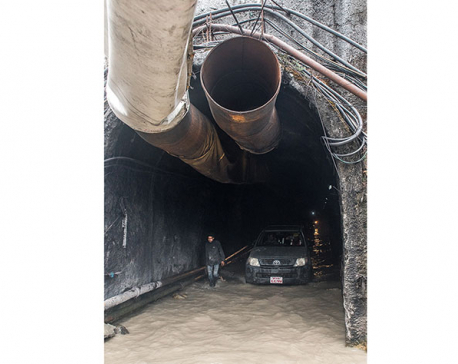 KATHMANDU, April 15: Prime Minister KP Sharma Oil on Tuesday is scheduled to make a breakthrough of the tunnel of Bheri Babai Multipurpose Diversion Project (BBDMP). KUALA LUMPUR, April 12: Malaysia and China agreed on Friday to resume construction of a multi-billion dollar rail project, shaving nearly a third of the cost, after months of negotiations that strained ties between the two trade partners. 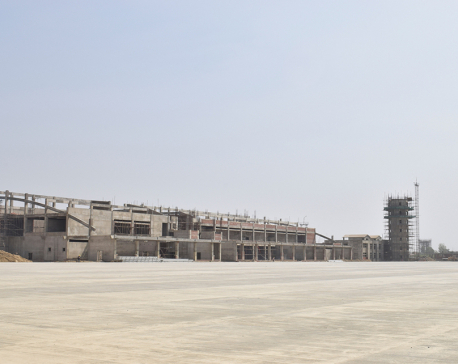 BHAIRAHAWA, April 4: The capacity of Gautam Buddha International Airport, a national pride project that is currently under construction, is being expanded even before the completion of construction. 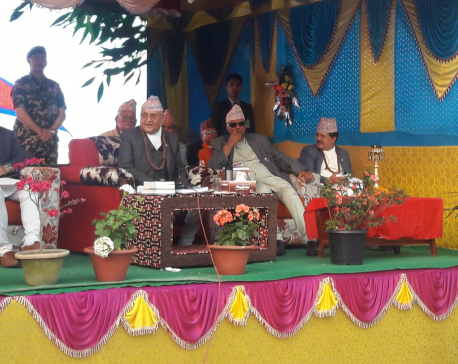 DAMAK, April 1: Prime Minister KP Sharma Oli on Sunday made an announcement to build an earthquake museum in Damak that will create awareness among the upcoming generation about the catastrophic earthquake of 2015. Govt building Bailey bridge to help Pappu Construction build a concrete bridge! GORKHA, March 30: The government has decided to construct a Bailey bridge to help Pappu Construction, notorious for leaving many infrastructure projects incomplete, complete a bridge project across the Trishuli River, that will join Chitwan's Ichhyakamana Rural Municipality and Gorkha's Gandaki Rural Municipality. KHALANGA, March 28: A man has died after his under-construction house collapsed. His wife was also seriously injured in the incident, and is still in critical condition. HUMLA, March 27: Humla residents continue to risk life while crossing rivers in lack of safer bridges. They still depend on risky tuins (a makeshift cable crossing) to cross rivers and reach their destinations. 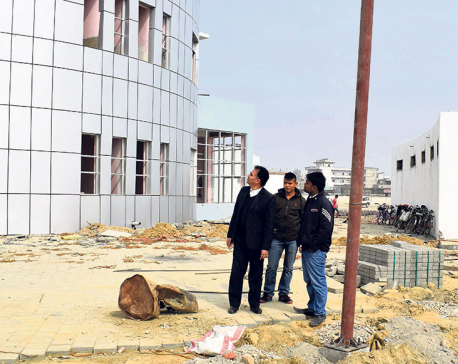 BIRGUNJ, March 25: More than 1,400 households of Tangiya settlement at Jitpursimara Sub-Metropolitan City in Bara district do not have land ownership certificate and are living as landless squatters. SINDHUPALCHOWK, March 24: The construction sector has been denigrated because of a rising trend of working at low bidding, according to Rabi Singh, president of Federation of Contractors’ Association Nepal (FCAN). BUTWAL, March 22: Prime Minister KP Sharma Oli observed the under-construction Gautam Buddha International Airport at Bhairahawa of Rupandehi today and acquired information on its progress. KATHMANDU, March 20: The government has built 94 bridges in the current fiscal year 2018/19 so far. 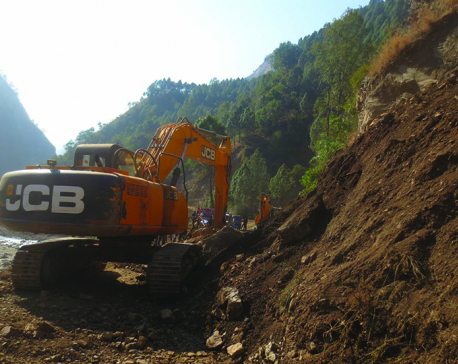 ROLPA, Jan 28: Construction of roads was always the major demand of the people in Rolpa's villages and towns. This was what they asked for with the candidates during the last local level election. KATHMANDU, Jan 27: Parliament's sub-committee formed for field study of progress of airports under the national pride projects has recommended the International Relation Committee (IRC) to direct concerned authorities to take immediate action for construction of Nijgadh International Airport (NIA). BIRGUNJ, Jan 24: Construction work on a bus terminal in Birgunj is still not complete 45 months after the project started. KATHMANDU, Jan 23: Division Forest Office (DFO), Rasuwa, has instructed Nepal Electricity Authority (NEA) to stop transmission line construction work in forest areas of the district. KATHMANDU, Jan 20: Kathmandu Metropolitan City's plan to build public toilets in the Kathmandu Valley is in limbo for two years. SOLUKHUMBU, Jan 12: Works at the Solukhola Dudhkoshi Hydropower Project in Solukhumbu have stalled for the last three months after its Italian contractor abandoned the project site, according to officials of the developer company. 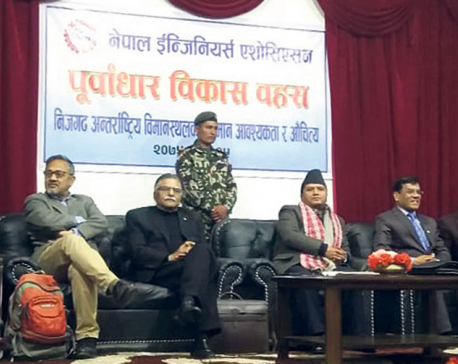 CHITWAN, Jan 8: Former Prime Minister and Chairperson of Nepal Communist Party (NCP), Pushpa Kamal Dahal has said that ruling and opposition parties are together in the campaign of development construction and reconstruction. 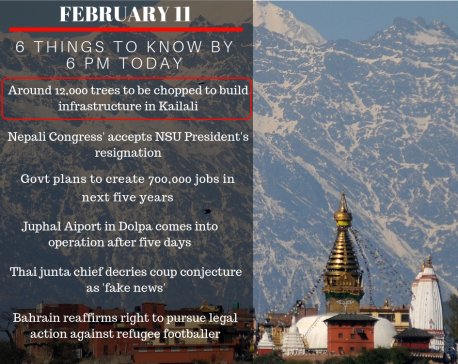 BANEPA, Jan 5: The construction work for Panchkhal Special Economic Zone (SEZ) is finally set to begin, seven years after the forest area was acquired as government land. 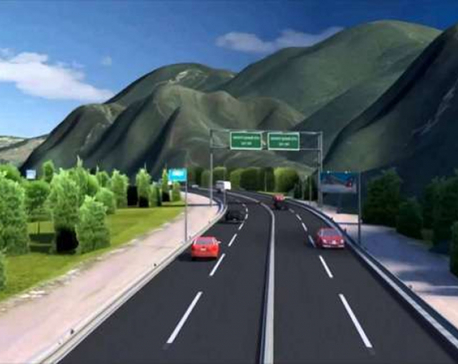 KATHMANDU, Dec 22: The construction of the fast track linking Kathmandu to Tarai has been found satisfactory. The Nepal Army is tasked to complete the construction of the fast track, a national pride project. 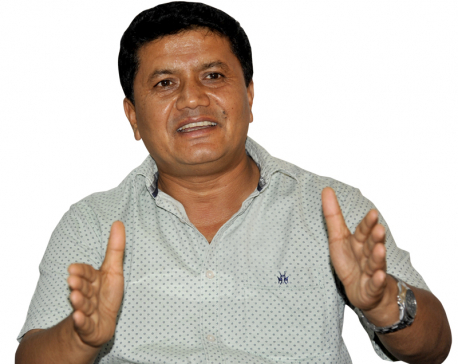 KATHMANDU, Dec. 21: Minister for Physical Infrastructure and Transport Raghubir Mahaseth has said that construction works of bridges would be monitored from the initial stages in the upcoming bridge projects. 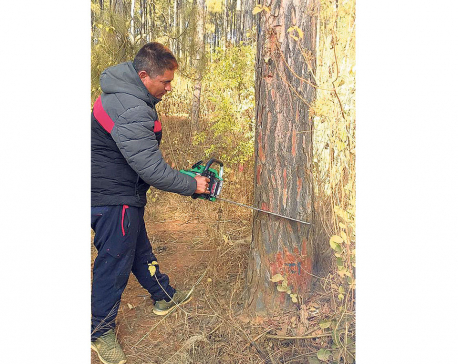 PARBAT, Dec 20: Works on the construction of power transmission line of the Kaligandaki Hydropower Project have been affected as the project of national pride awaits orders to chop off trees for the purpose. 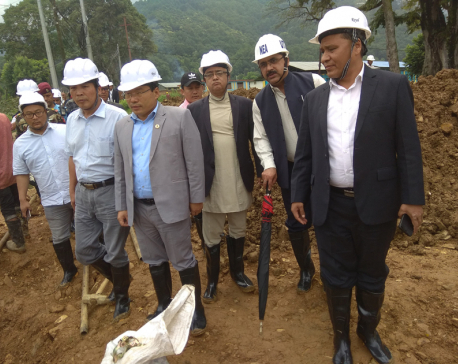 POKHARA, Dec 14: Minister for Culture, Tourism and Civil Aviation Rabindra Adhikari has claimed that the construction of Pokhara International Airport would be completed before the stipulated date. 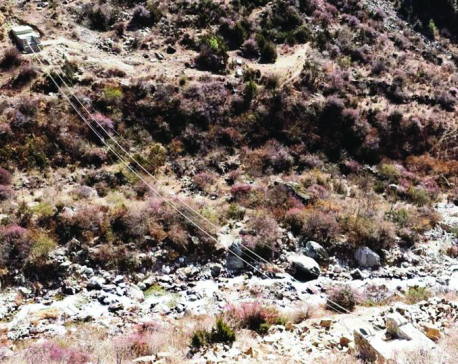 DOLPA, Dec 9: The construction of a motorable bridge along the Rupagadh River in Thulibheri Municipality-8, which kicked off three years ago, has remained stalled. POKHARA, Dec 4: After nearly two decades runway of the Jomsom Airport is being repaired. The runway was in dire need of repairs for a long time now. According to Pushparaj Neupane, an engineer with the Civil Aviation Authority of Nepal (CAAN), the repair project worth Rs 800 million has already kicked off. “The work of erecting fences around the airport is almost over. 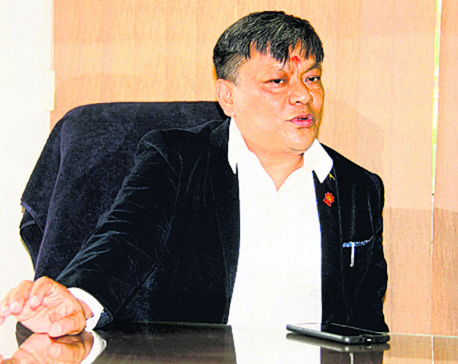 Blacktopping of the runway and construction of parking area will follow soon,” he said. KATHMANDU, Dec 3: Secretary at the Ministry of Water Supply (MoWS), Gajendra Thakur, has claimed that the construction work of the much-awaited Melamchi Water Supply Project will be completed within two months. MYAGDI, Nov. 28: The construction works of Ghalemdikhola Hydropower Project have progressed around 90 percent of the total physical infrastructure. The project of 5.5-megawatt capacity is likely to come into operation within four months, the officials said. PARBAT, Nov 25: The Lower Modikhola Hydropower with the capacity of 20 MW is to come into operation from coming mid-January. KATHMANDU, Nov 22: The Building and Construction Expo-2075 has begun in the Capital from today with an objective of providing information related to building and construction at one place. KATHMANDU, Nov 20: The Nepal Transport Workers Association has demanded construction of public toilets in bus stops of the Kathmandu Valley. 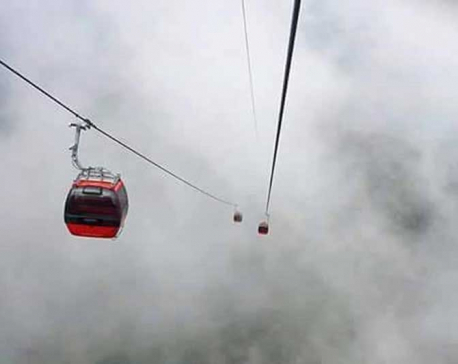 PARBAT, Nov 10: Cable car transportation is to be constructed connecting Panchase, the famous touristic and religious place situated at the tri-junction of Parbat, Kaski and Syangja districts. 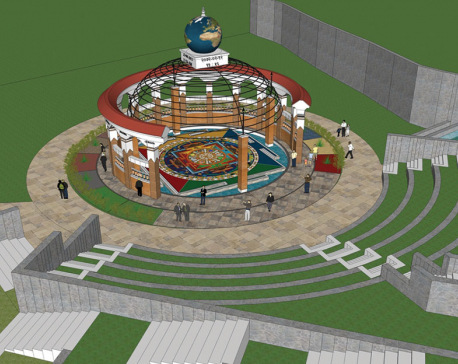 GORKHA, Nov 4: The construction of the much-hyped Earthquake Memorial Park in Barpak, the epicenter of the catastrophic earthquake of 2015, remains stalled halfway. As per the agreement, the project should have been completed by now. However, only 30% of the work has been done so far. MYAGDI, Oct 28: The Raghuganga hydropower project has annulled a construction contract with a contractor after it failed to complete work even seven years after the first deadline. 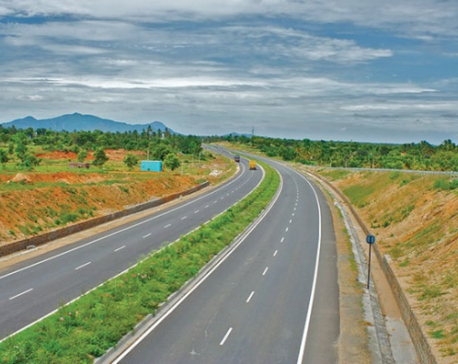 BUTWAL, Oct 25: Upgrading of the Butwal-Baheliya road stretch to six-lane highway has been ongoing for the last six years. Thousands of vehicles ply through the road every day. This 27-kilometer long road connects to the second biggest business border point of the country. The same road connects to Lumbini through Butwal-Bhairahawa road. However, a road of this level of importance is in a sorry state due to ‘never-ending construction’. The construction of Gautam Buddha International Airport, which is already delayed by a year, is expected to be complete by next year, according to latest reports. MYAGDI, Oct 1: Locals have halted works at the project site of Mristikhola Hydropower Project (42 MW) at Narchyang village in Annapurna Rural Municipality-4. RAUTAHAT, Sept 26: The District Administration Office (DAO), Rautahat on Tuesday issued an arrest warrant against Sumit Rauniyar, the owner of Pappu Construction, on the charge of failing to complete infrastructure projects in the district on time. Rauniyar is the son of lawmaker Hari Narayan Prasad Rauniyar. 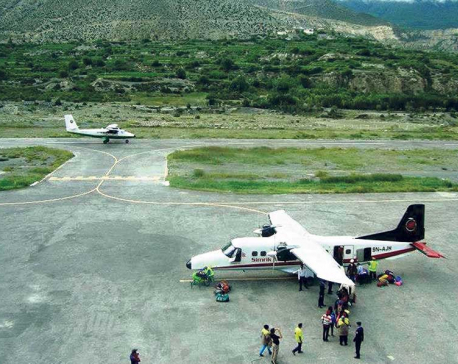 PYUTHAN, Sept 24: A plan with an estimated cost of Rs 770 million was unveiled for the construction of Swargadwari (Chalnetar) Airport in Pyuthan. DARCHULA, Sept 23: The construction of a suspension bridge at Lalima of Lekam rural municipality-3 in Darchula has been left neglected for the past three months. When the country initiates a big infrastructure project it should obviously consider economic viability, how the project will benefit the country and people and how the government will manage funds for the project. 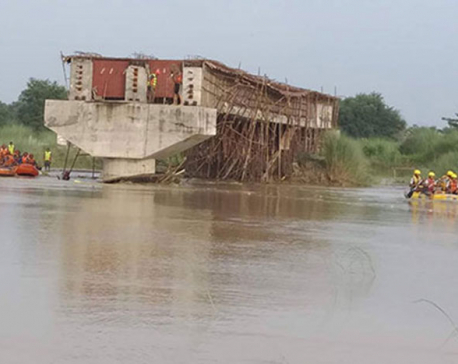 BIRATNAGAR, Sept 3: Minister for Physical Infrastructure and Transport Raghubir Mahaseth has reaffirmed that action would be taken against the Pappu Construction Company for its negligence in building the bridge on time. ROLPA, Aug 17: The construction of Madi rivulet bridge linking west Rolpa with district headquarter, Liwang, is beginning from today. KATHMANDU, Aug 5: The construction of the first-ever underground electricity transmission line of the country has completed its 48 percent work. 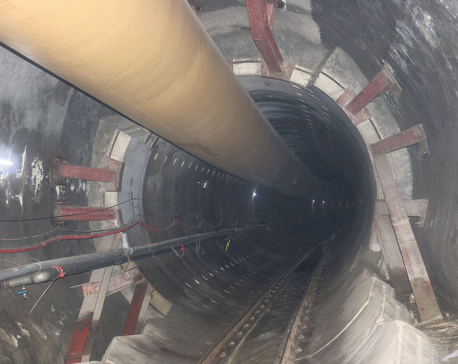 One thousand three hundred nine meters long underground line is to be made at Matatirtha under Trishuli-Kathmandu 220 KV double circuit transmission line. LALITPUR, July 30: The construction of private houses of beneficiaries – legally partitioned yet having joint ownership of land – has not gained any momentum.